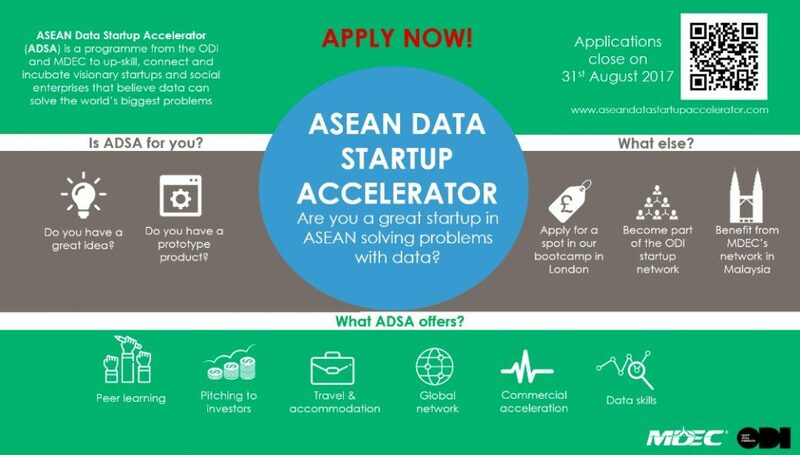 Calling start-ups in ASEAN solving problems with data! Data is the infrastructure of the new economies. It is helping outstanding organisations around the world solve common problems from making our cities smarter to curing illnesses and fighting famine. If yes, this programme is for you. Six-month accelerator with help from the ODI and MDEC. Fully-funded bootcamps in Kuala Lumpur. Selection bootcamp on w/c 25 September 25 startups will be invited to a week-long experience to pitch for one of 12 places. Commercial bootcamp in November One week of advice on pitching, business models and intro to angel investors. Data bootcamp in January One week of data science training to bring your offering to the next level. Showcase events with investors at a graduation event in March 2018. Connections to the ODI’s global network and associated events. A chance to apply for a week-long boot camp in London at the ODI’s HQ in Feb 2018. This suite of services is valued at over USD$20,000. You do not need to relocate to Kuala Lumpur for the programme, but you should be at ADAX for the bootcamps. The organizers are particularly interested in startups that are using or publishing open data, partnering (or wanting to partner) with larger organisations, and developing solutions for agriculture, future cities, the internet of things, media, telecommunication and financial services and other data driven sector. Can you commit to attending all three week-long bootcamps?If the answers to all three are yes, then you are exactly what we are looking for. Complete this application form given in the APPLY NOW section. Please reach out to Divakar, [email protected] for more details.